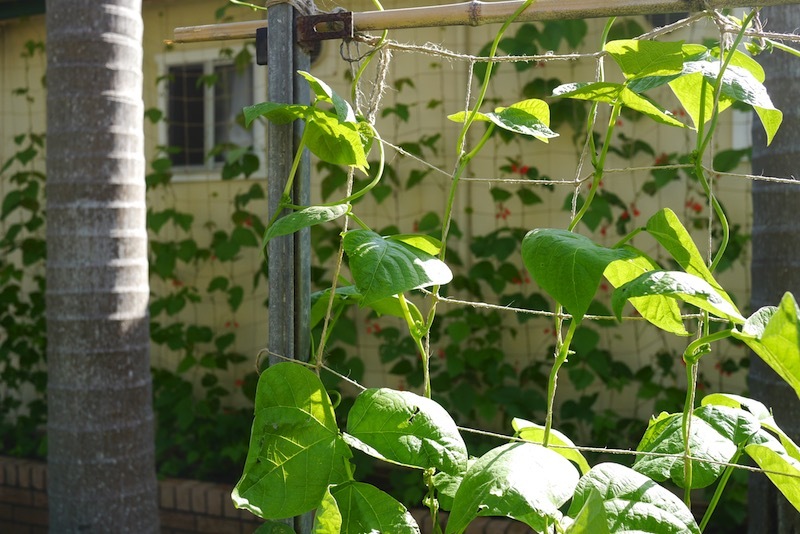 Growing climbing beans and peas on a trellis is a great way to maximise your garden’s growing space, while providing habitat and shade that further helps your garden grow. 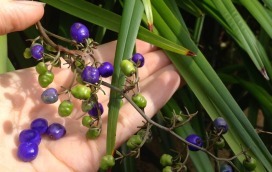 There’s all sorts of things you can use – what will suit you best depends on your garden’s context, and what you’re growing. First of all, make sure you’ve planted climbing (sometimes called pole) beans, or climbing peas. The term bush/dwarf bean or pea means the plant doesn’t climb high but instead exists as (yep, you saw this coming) a low bush that doesn’t need a trellis. 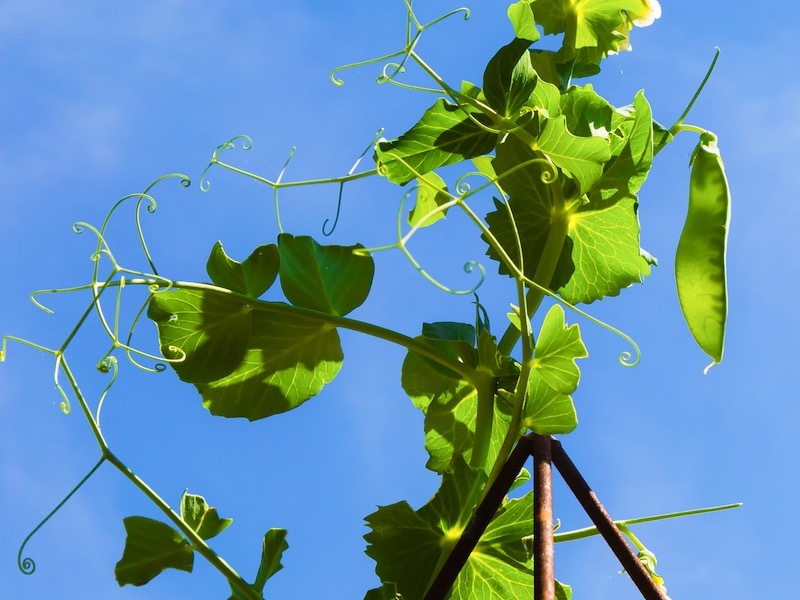 So – once you’ve definitely got seeds or seedlings of climbers, you’re ready to go. 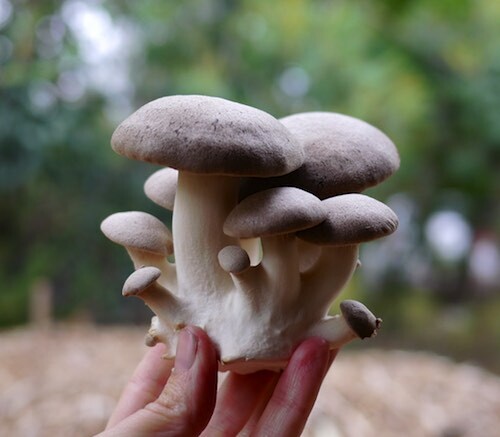 This might seem completely obvious once you’ve been growing for a few seasons, but until you know, you don’t! Beans and peas are fundamentally different in how they climb. Peas send out little side tendrils that cling to trellises like tiny hands, and hold on that way – the central plant grows straight (ish) upwards, relying on it’s curly hands for support. 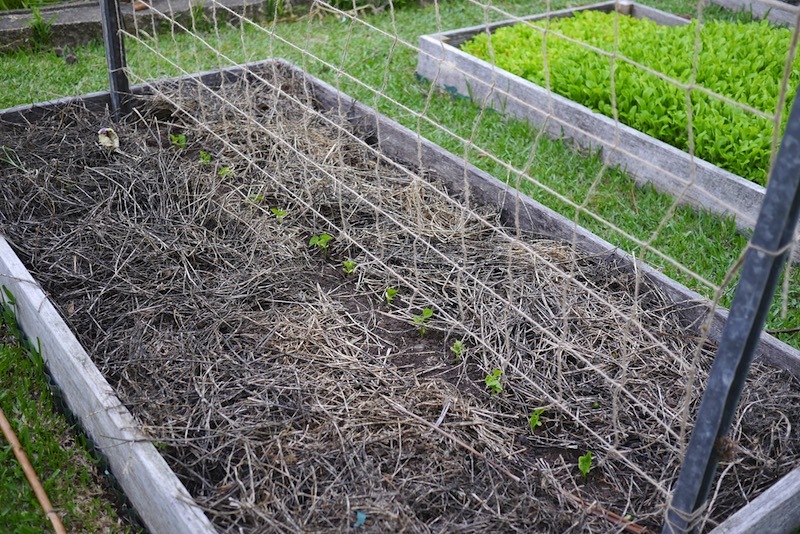 Therefore, pea trellises need to include thin wires/strings etc, so that the pea’s little tendrils have something to hang on to as they grow. 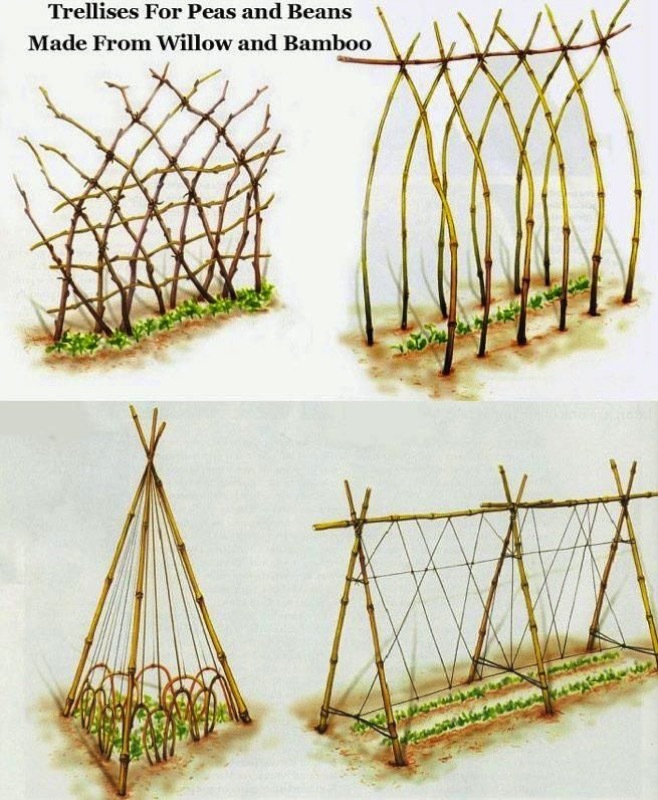 Beans, however, twine upwards with the whole plant, so they can handle chunkier trellises made of bamboo, wood etc. 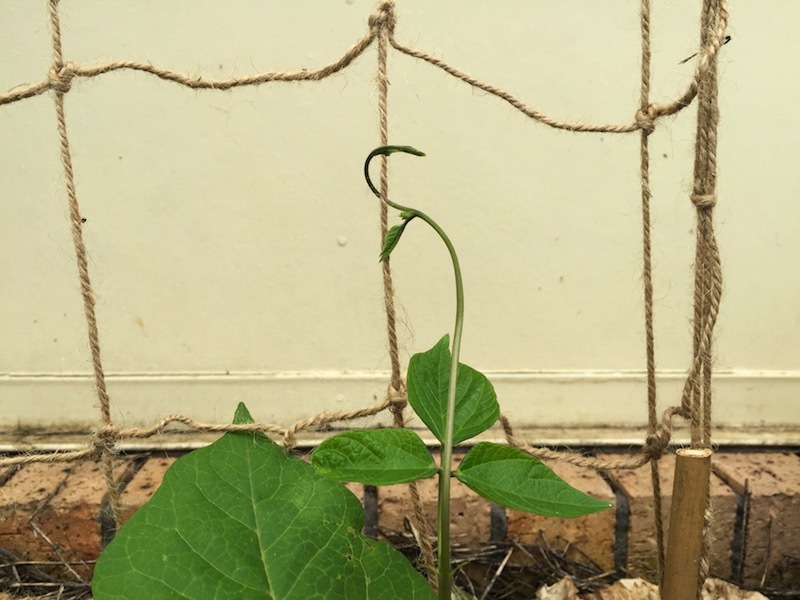 This is why they’re sometimes called pole beans – cause all they need is a pole, and up they’ll grow. The name for the process by which both peas and beans do their inherent twirly hanging-on is called thigmotropism. Its pretty darn wonderful. Here’s a sped-up video of beans doing their thing. 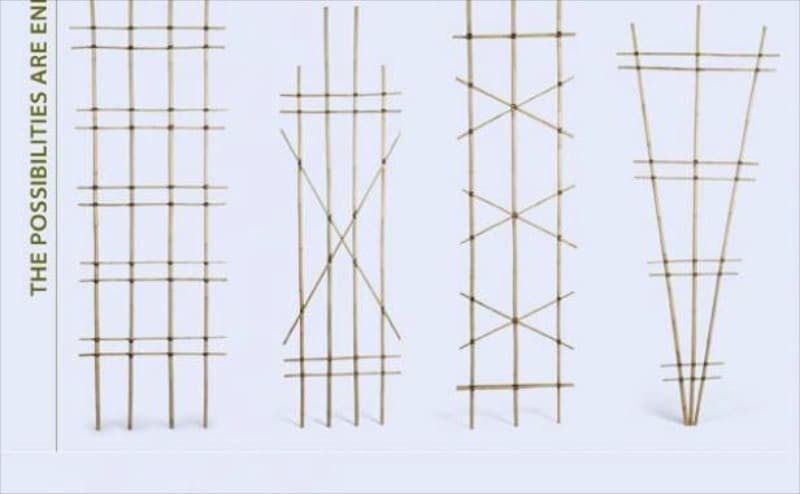 Which trellis to use depends on your garden’s context – is it a permanent trellis that you’re wanting? Are you renting and may need to pull it down in 12 months time? What’s your budget? Is it windy where you are? All these factors and more come into play. 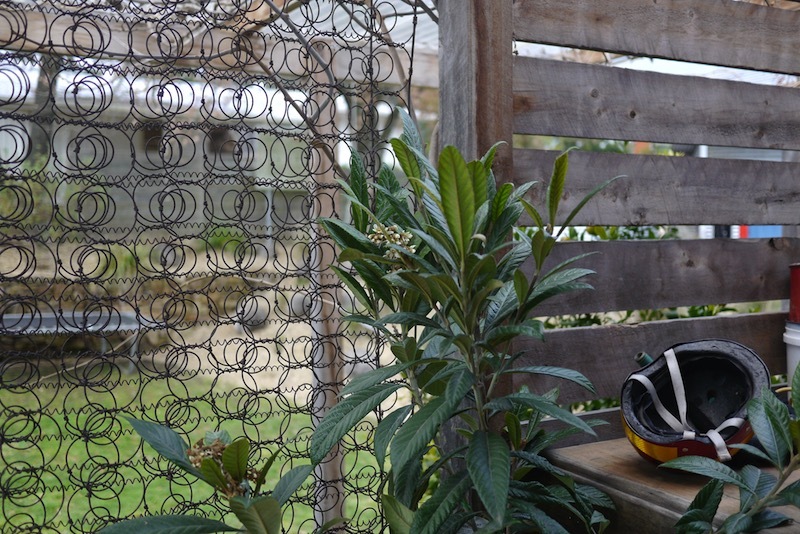 Places like your local tip shop are a great place to source scrap chicken wire or old screen doors, and your local reserve or railway siding may well have some bamboo just waiting for someone to love it and turn it into stakes. And then, there’s also garden centres, of course, which have all sorts of options, but none of them as fun (or an low-impact) as finding something second hand or DIY. Bean tipi‘s are always a good idea, especially if you need an in-garden cubby house. Bamboo A-Frames with string – here’s a good example. Use the ‘Three Sisters’ technique of growing corn, pole beans and cucurbits in the same bed – here’s a US example and an Aussie one too. 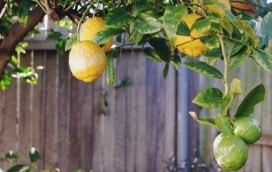 For any and all trellises that you decide to use, however, there’s one thing to remember – make it sturdy. It’s hard to imagine when all you have in your hand is a small pile of seeds, or seedlings, but once your peas and/or beans are fully grown, they will be heavy. So give them the support they need from the start to grow high and strong, against wind, bird visitors, and the hopeful weight of their pods. At our place, we’re growing climbing beans in quantity (snow peas will go in later this season). We’re using them as a shade for our house along one wall, and growing them down the middle of a veggie bed as well. 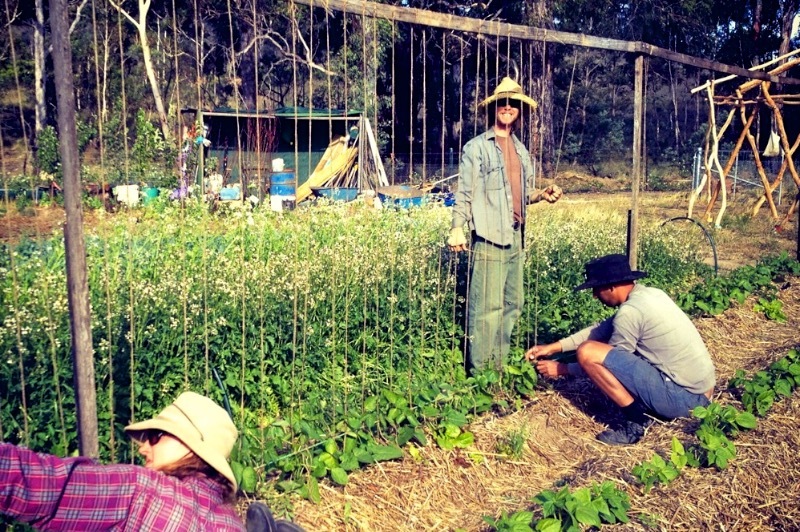 Running a trellis down the middle of a garden bed is a great idea – it helps maximise the vertical space in that garden bed, as other crops can be planted alongside and reap the benefits of having beans or peas, both soil building plants thanks to their nitrogen-fixing root nodules, growing right next door. The other great thing about in-garden trellises is the shade factor. Once the strength of Summer hits, if your garden is sunny, there will be plants that may suffer under a full day of sun each day. Depending on how you design your beds, a north-south trellis down the middle can enable dappled shade for part of the day to each side of that bed, and for its veggies too. Another way to work the edges and use good design to ensure bountiful harvests. 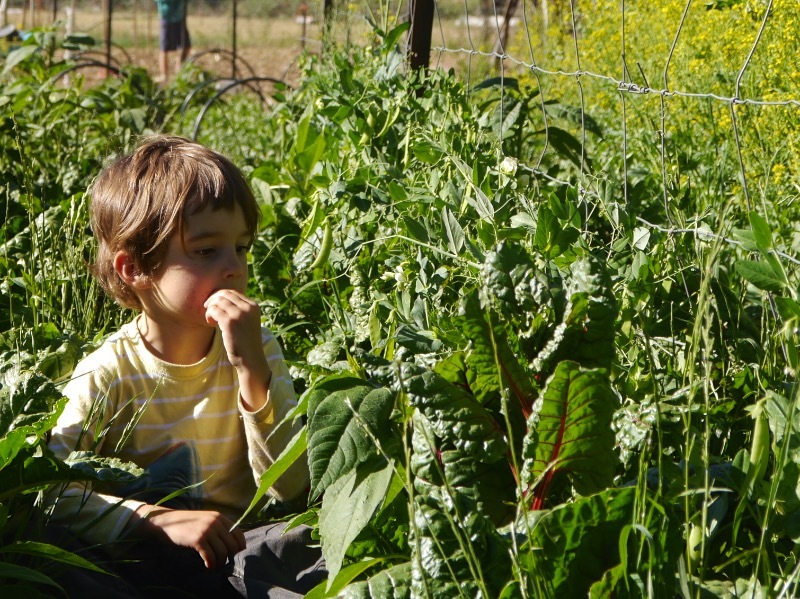 Learning how to establish a profitable urban farm takes a LOT of . . Lately I have been using pieces of an old wire wardrobe insert as a trellis, I just move the pieces around my garden to where its needed. In QLD sub-tropics peas grow better in winter, so I can alternate between winter peas and summer beans! 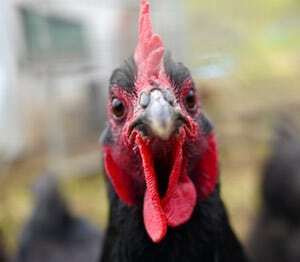 I learnt a new word today – thigmotropism!